Having an exceptional cook as a friend, who is also generous with her recipes is a rare thing. I did have an Italian friend whose mother produced the most wonderful food but getting a particular recipe however hard I tried came to nothing. Even my own mother in law was furious when once at a Burns evening, I complimented her on her swedes and asked what she had put in them, my father in law, quick as a flash replied a spoonful of sugar, ignoring her cry of protest. An icy presence over the meal followed, but I didn’t care – I had the secret ingredient! Recipes are tricky things, so many times I have come home and made ‘the recipe’ only to find it didn’t quite turn out as it should. The mock surprise look at the recipe owner usually tells me what I need to know – their ingredient ‘x’ is missing from the recipe. Still, it hasn’t put me off – I still ask. Luckily for me I met someone several years ago who came from Brittany, France. She was very proud of her heritage and the food of Brittany and very generous in passing on her recipes, her attitude was that by passing them on they continue to live. I have several of her recipes, which have turned out just as she had made them and how I had remembered enjoying them. 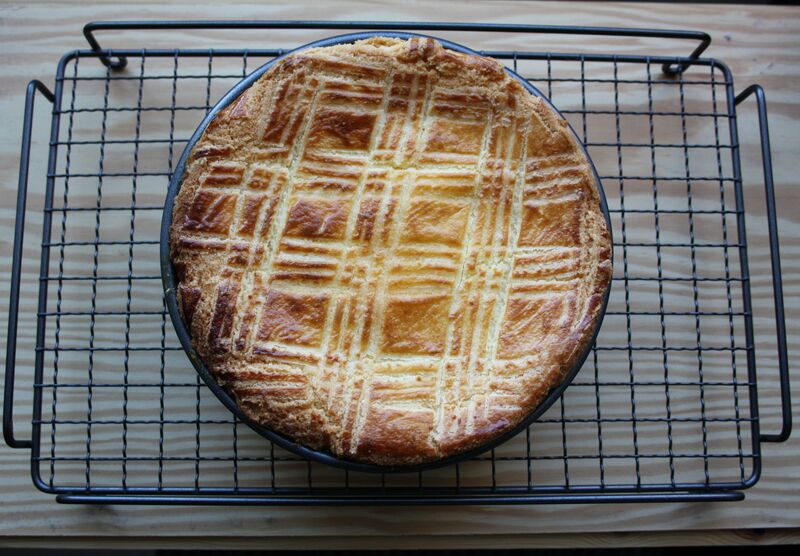 Gâteau Breton is difficult to describe, as it is a cake and not a cake. 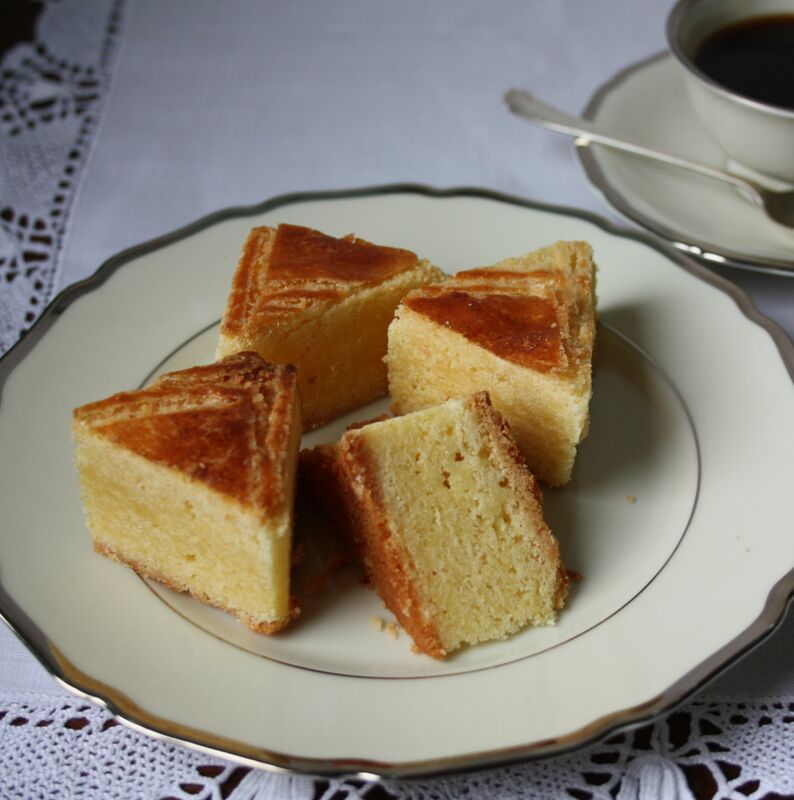 It is a cross between buttery shortbread and Madeira cake. One of the joys of baking this gâteau is that it fills the house with the most wonderful buttery smell whilst it is in the oven. Add the softened butter and caster sugar together in a bowl and mix until light and fluffy. Add the 5 egg yolks, a yolk at the time (I break the sixth egg yolk and put half in the gâteau at this stage and save half for the glazing as a whole yolk is far too much) Mixing until combined. Add the flour but not all at once. Keep adding flour until all have been combined. The mixture at this stage will be quite stiff. 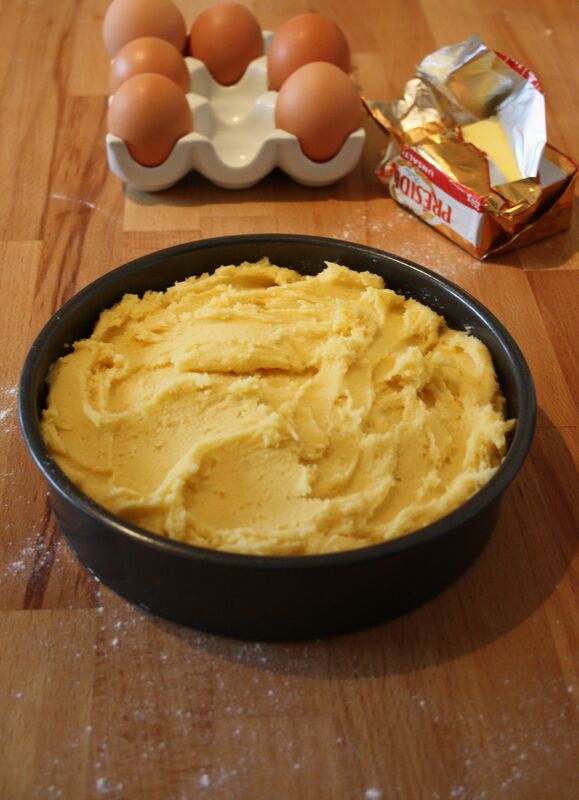 Put the mixture into a loose 8” bottom cake tin or spring form tin. With a knife evenly distribute the mixture and put into the fridge for 30 minutes. This will allow the mixture to stiffen further. After 30 minutes remove from the fridge and again with a palate knife smooth the top of the gâteau and coat with the remaining egg yolk. Taking a fork, drag across the gâteau to create the criss cross lines decoration. Bake in the oven and carefully check after 30 minutes that the top has not browned too much, if it is browning too quickly, cover for the rest of the cooking time. To check that the gâteau is cooked press your finger gently in the centre, it should be firm with a slight bounce. Leave the gâteau in the tin until it is cool. Once cool it should be kept in a airtight container. It is perfect cut up into triangles and served with coffee. You are welcome and thank you for leaving a comment it meant that I got the chance to find your site. The photo of your cake batter in the pan does look more like cookie dough than batter, Maria. But it’s your description of its aroma as it bakes that sold me on the recipe. Who could possibly resist that? Thank you for sharing this with us. I agree with you John, that’s why I put a picture up because it doesn’t turn out like a cake mixture. I really wonder why its called a gateau because its doesn’t really conjure up what I would term gateau like. It is worth cooking just for the aroma – which sends my dog mad. He can smell that gateau from two rooms away! Thank you so much. I have a beautiful camera which I have little idea of how to use but I do struggle over the photography. 2013 will be the year I learn how to use some of the settings! I have run into people who hoard their recipes. Such a shame! They should be shared. Hence all of us blogging. 🙂 This looks delicious. Thank you. Yes, where would we all be without the internet? I know, I love discovering new recipes. i get so annoyed when people don’t share their recipes or worse, give us the wrong recipes. it’s infuriating! Yes! I have had a couple of wrong recipes!! It just makes me want the recipe all the more. The pattern is the most satisfying – as it is so easy. Thank you so much for your lovely comment. I think the true way to copy a recipe is to actually stand over them and watch! !